This computer-generated view based on multiple orbital observations shows Mars' Gale crater as if seen from an aircraft north of the crater. Because of its history, 96-mile wide Gale Crater crater landing site, with its strangely sculpted mountain –three times higher than the Grand Canyon is deep–is the ideal place for Curiosity to conduct its mission of exploration into the Red Planet's past. Researchers plan to use Curiosity to study layers in the mountain that hold evidence about wet environments of early Mars. 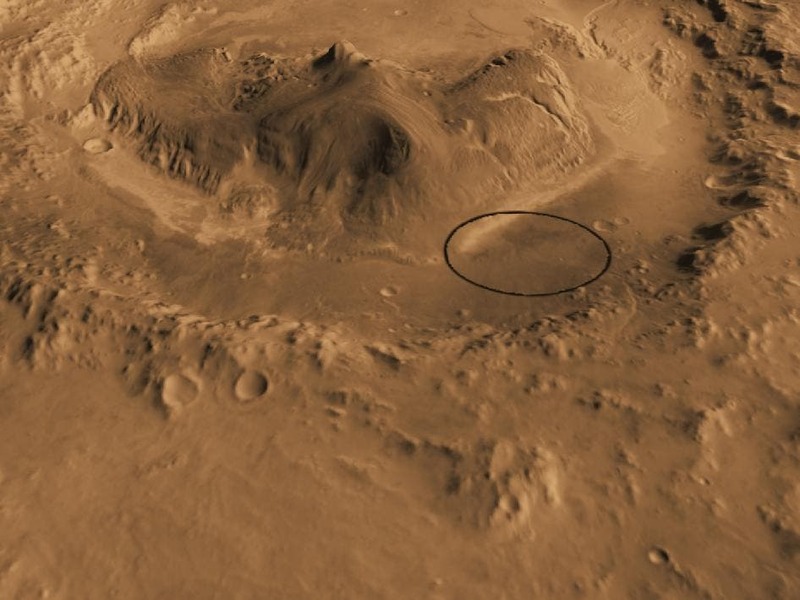 Gale crater is 96 miles (154 kilometers) in diameter and holds a layered mountain rising about 3 miles (5 kilometers) above the crater floor. The ellipse superimposed on this image indicates the candidate landing area, 12.4 miles (20 kilometers) by 15.5 miles (25 kilometers). The portion of the crater within the landing area has an alluvial fan likely formed by water-carried sediments. The lower layers of the nearby mountain — within driving distance for Curiosity — contain minerals indicating a wet history. The candidate landing site is at 4.5 degrees south latitude, 137.4 degrees east longitude. This view was created using visible-light imaging by the Thermal Emission Imaging System camera on NASA's Mars Odyssey orbiter and three-dimensional information from the Mars Orbiter Laser Altimeter, which flew on NASA's Mars Global Surveyor orbiter. Color information is generalized from color imaging of portions of the scene by the High Resolution Imaging Science Experiment camera on NASA's Mars Reconnaissance Orbiter. The vertical dimension is not exaggerated. In a prime mission lasting one Martian year — nearly two Earth years — after landing, researchers will use the rover's tools to study whether the landing region has had environmental conditions favorable for supporting microbial life and for preserving clues about whether life existed. New NASA research that lays out the optimal depths and locations to probe for organic molecules like those that compose living organisms as we know them, could help the newest Mars rover scout for evidence of life beneath the surface and within rocks. The results suggest that, should Mars harbor simple organic molecules, NASA's prospects for discovering them during Curiosity's explorations are better than previously thought, said Alexander Pavlov of the NASA Goddard Space Flight Center in Greenbelt, Maryland, lead author of the study. While simple molecules could provide evidence of ancient Martian life, they could also stem from other sources like meteorites and volcanoes. Complex organic molecules could hint more strongly at the possibility of past life on the planet. These molecules, made up of 10 or more carbon atoms, could resemble known building blocks of life such as the amino acids that make up proteins. Although complex carbon structures are trickier to find because they're more vulnerable to cosmic radiation that continuously bombards and penetrates the surface of the Red Planet, the new research by Pavlov and his colleagues provides suggestions for where to start looking. The amounts of radiation that rock and soil is exposed to over time, and how deep that radiation penetrates – an indicator of how deep a rover would have to sample to find intact organic molecules – is a subject of ongoing research. The scientists report that chances of finding these molecules in the first 2 centimeters (0.8 inches) of Martian soil is close to zero. That top layer, they calculate, will absorb a total of 500 million grays of cosmic radiation over the course of one billion years – capable of destroying all organic material. A mere 50 grays, absorbed immediately or over time, would cause almost certain death to a human. However, within 5 to 10 centimeters (2 to 4 inches) beneath the surface, the amount of radiation reduces tenfold, to 50 million grays. Although that's still extreme, the team reports that simple organic molecules, such as a single formaldehyde molecule, could exist at this depth – and in some places, specifically young craters, the complex building blocks of life could remain as well. "Right now the challenge is that past Martian landers haven't seen any organic material whatsoever," Pavlov said. "We know that organic molecules have to be there but we can't find any of them in the soil." As Mars revolves around the Sun, it is constantly bombarded by very small meteors and interplanetary dust particles, which have plenty of organic compounds in them, Pavlov said. Therefore, over time they would have accumulated at the Martian surface. The Mars Science Laboratory is the newest and largest of NASA's Martian landers. Curiosity doesn't have a shovel but, equipped with drilling technology, it will collect, store, and analyze samples of Martian material down to 5 centimeters below the surface of rock and soil. Past Martian rovers have only collected loose soil atop the surface that has been directly exposed to cosmic radiation, making the possibility for detecting organic molecules exceedingly slim. When evaluating how deep organic molecules might persist beneath the surface, previous studies have mainly focused on the maximum depth, approximately 1.5 meters (5 feet), that cosmic radiation reaches because beyond that point organic molecules could survive, unharmed, for billions of years, Pavlov said. However, drilling to 1.5 meters or deeper is currently too expensive to engineer for a Martian rover. So the team focused on more attainable depths – the first 20 cm (8 in) below the surface. They modeled the complex scenario of cosmic ray accumulation and its effects on organic molecules using a collection of important variables, including Martian rock and soil composition, changes in the planet's atmospheric density over time, and cosmic rays' various energy levels. In addition to the finding that some simple carbon-containing molecules could exist within 10 cm (4 in) depth, the scientists emphasize that certain regions on Mars may have radiation levels far lower than 50 million grays near the surface – and so more complex molecules like amino acids could remain intact. In order to find these molecules within the rover's drilling range (1 to 5 cm), the scientists found the best bet is to look at "fresh" craters that are no more than 10 million years old, unlike past expeditionary sites that mainly sampled from landscapes undisturbed for billions of years. Compared to Martian landscapes undisturbed for one billion years or more, relatively young craters exhibit freshly exposed rock and soil that was once deeper beneath the surface. The new research indicates that this material will have been near the surface for a short enough period of time that it's overall exposure to harmful radiation would not have been enough to wipe out organic molecules. "When you have a chance to drill, don't waste it on perfectly preserved (landscapes)," Pavlov said. "You want to go to fresh craters because there's probably a better chance to detect complex organic molecules. Let Nature work for you." "The next logical step," said Lewis Dartnell, a postdoctoral researcher at the University College London in the U.K, "is to actually experiment and have a radiation source hit amino acids with radiation of similar energies as cosmic rays and determine how quickly those amino acids are destroyed because models can only do so much." Curiosity is set to land in the same crater where the Spirit rover landed in 2004. Whether this 3.5-billion-year-old crater has fresher craters within it is uncertain. However, Pavlov hopes that his team's findings will at least help guide NASA on where to drill once the rover has landed and influence where future generations of rover landers will touch down.